Apostle Kenneth Kiarie of God’s Covenant Holiness Church in Mihang’o, Kayole in Nairobi ended his marriage of 87 days and sent his 23-year-old pregnant wife packing. They wedded in April this year. 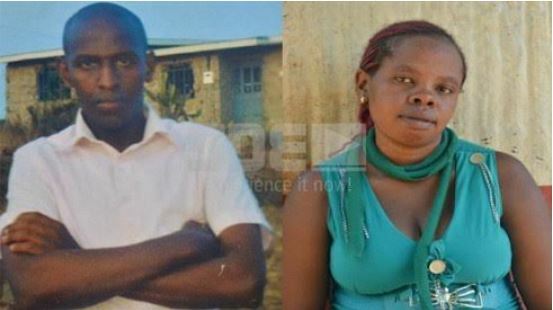 The 30-year-old pastor told The Nairobian that he hurriedly married Marion Wagitu “because being a pastor, I needed a wife officially married in church.” adding that he borrowed money to finance their wedding which has now left him in debt. The two fell in love when Marion, whom he saw as a ‘humble rural girl’ attended his church. The pastor is being accused of throwing out his newly wedded wife to marry another woman. Even before the honeymoon was over, their marriage hit the rocks sometime in July, with both parties pointing accusing fingers at each other. “He used to tell me that if I left, I would not get a husband, and that he had scores of beautiful girls hanging around him,” says Marion, who is now back at her Murang’a village. Marion says he married Kiarie because he is a pastor, but their marriage has been a bumpy one, with Kiarie allegedly blaming her for the declining congregation numbers and tithe amounts in his church, because of her odd behaviours in and out of the church. “He blames me over a Sh70,000 debt he incurred to fund the wedding. He claimed I threw hot tea and stove at him and attempted to beat him in front of his parents,” says Marion, adding that the man of God often left her with Sh5 for cooking oil on grounds that she was a villager. However, Pastor Kiarie denied the accusation and instead accused Marion of destroying their marriage through her weird behaviour, offensive words, attempt to assault him in front of friends and blood relations and accusing him of infidelity. “Actually, that was the third time I chased her and it has now been successful. She wanted to control me but that is not African. I said we rather separate than have one of us dead,” he explains. The short-lived marriage has been the talk of the village in Gaturi, Murang’a County and in Kayole. Kiarie says events that followed the wedding left him broke and unable to cater for her and their unborn baby. “I did not want to send her away. I have never assaulted her, but being a pastor, everybody thinks I am the problem. A wife means a lot to a man, but Marion is not worth living with. She will harm me,”claims Kiarie. While Marion claims the pastor was pressurised by his parents and siblings to dump her, Kiarie says she was spoilt by her parents who failed to reach out to the other side and mend differences. Both admitted that the four months they courted was too short to really know each other. “We had not shared a house or bed before we wedded,” says Kiarie. Marion’s father, Gabriel Chege says he overlooked Kikuyu traditions by allowing the wedding to take place before Kiarie had paid bride price.